Paddy saplings have been grown near the mandap to decorate the 50-foot high pandal which will be put up on the pandal just before the Sasthi Puja. Multi-coloured lights, themes raging from bizarre to the sublime are all set to make this year’s biggest festive extravaganza all the more interesting. Different puja communities across Bhubaneswar are offering an astonishing diversity this autumn. And with Puja just about a week away, craftsmen mostly from West Bengal are working overtime to give shape to pandals that would house Mother Goddess. Instead of replicating popular structures of the previous years, this year the committees are trying to outdo one another through creative themes. The Rasulgarh Puja Committee is going eco-friendly with the pandal designed as a Shiva temple atop a mountain made of paddy saplings, thermocol, pith of jute plant and bamboo. Paddy saplings have been grown near the mandap to decorate the 50-foot high pandal which will be put up on the pandal just before the Sasthi Puja. Around 40 artisans from West Bengal have been roped in for the work that began soon after Ganesh Puja. Nayapalli Puja Committee, on the other hand, has planned celebrations on a massive scale with this being the silver jubilee year. Though the theme of the pandal is being kept under wraps, Basant Behera, member of the Nayapalli committee, said, “We are trying to do something interesting with the lights.” Besides, idol of the Goddess will be different from the previous years as the committee has brought in a sculptor from Kendrapara. “In the last few years, we got complaints from locals about the appearance of the Goddess. So we decided to do away with the sculptor from Kolkata and roped in Kailash Sahoo, a master craftsman from Kendrapara,” Behera added. Similarly, Saheed Nagar Puja Committee is creating a pandal that replicates an 80-foot high ship with bamboo, plywood and gunny bags. “The Medha will be an added attraction as it will be made of golden jari,” said Narayan Mohanty, secretary of the puja committee. Here too, artisans from Kanthi, West Bengal, have been brought to create this piece of art. 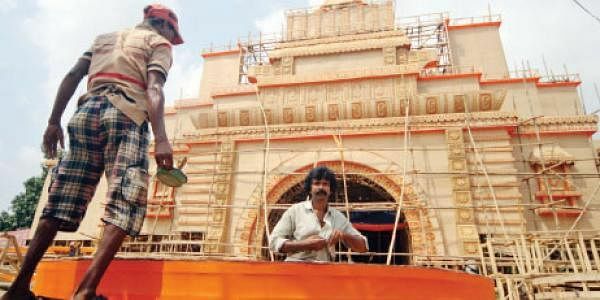 While the Old Station Puja Committee __ the oldest in the City __ is creating its pandal on the theme of Harry Potter and Spiderman, Jharpada Puja Committee is creating an 80-foot pandal on the lines of Boudh Gaiani temple. Like every year, the puja committees have lined up “bhajan samarohs” during the Puja. Besides, Ravana Podi along with exquisite fireworks will be organised at Rasulgarh, Jharpada and Nayapalli. All the three committees have prepared 50-foot high idols of the Demon King for the purpose. “Fireworks will be a speciality of our puja mandap as this is our silver jubilee celebration,” claimed Behera of Nayapalli committee. Apparently, lakhs of rupees are being spent this year for construction of these puja pandals. According to an estimate, each puja committee has coughed up about Rs 6 to Rs 10 lakh to put up the pandals.